ALL STALLS BOOKED !! Availability of further stalls & only against cancellation! Each Built up booth of 9 sq mtr includes Side & Rear Partitions with System, Synthetic Carpet inside Booth, Fascia with Company Name, one Reception Table, 3 Spot Lights, 2 Folding Chairs, one 5 Amp. Socket. The prospective Exhibitor should apply on the 'Stall Booking Form' together with payment. Allotment will be on "first come first served" basis subject to receipt of all payments. All payments should be made by Cheque or Demand Draft favouring " Plast Future East " at Balasore in Indian Rupees. Overseas companion may remit fees in USD through TT. Payment advance during the submission of Application Form, Application for space, both indoor and outdoor, may be made in combinations/multiples of continuous stalls/booths. For a combination of continuous, furnished indoor standard booth allotted, provision of partitions within the area would be optional. Rental includes passes for Exhibitor staff manning stands during the Fair. The Organizer reserves the right to reallocate space, change the layout, add or delete corridors in Space plans which may affect the orientation of some EXHIBITORS. The organizer's decision shall be final. The organizer also reserves the right to turn down applications for participation, or even deny participation to Exhibitors already confirmed. The Exhibitor any Company/Organisation participating in “PLAST FUTURE EAST” enters into a contract, with the Organizer upon submission of this document. The Company (Proposed Exhibitor) agrees to participate at the Exhibition and to abide by the regulations & by laws, handed out to the company, before the Exhibition. Upon any breach of contract by the company (Proposed Exhibitor), the company is liable to pay the space rentals in full, to the Organizer. Allotted power Per Stall is 200 W. If the power required is more than 200 W. per stall the exhibitor has to pay extra as per vendor's policy. 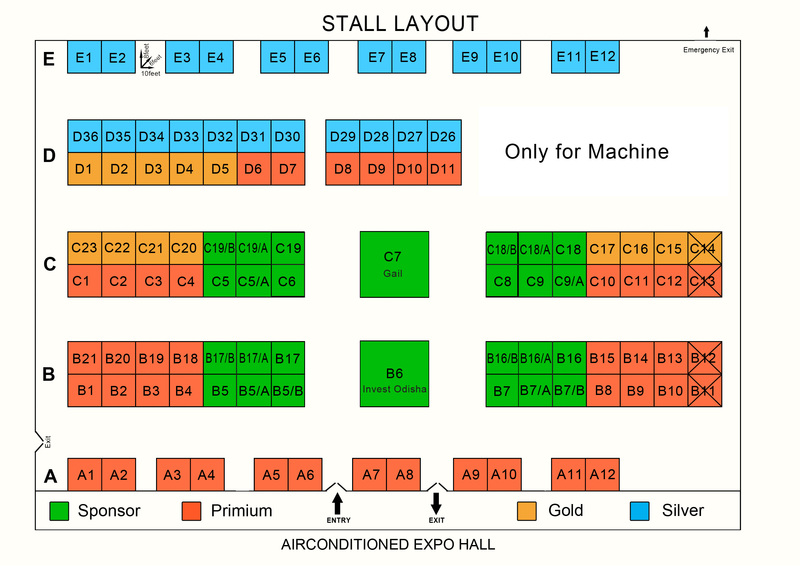 On requirement of more than 200 W. exhibitors are requested to use generator. Every exhibitor will have to submit their stand design for approval before seven days of the fair along with complete details of Exhibit, Electricity and other installation and elevation. Layout / design of the stall by respective company will be approved by the Organisation Committee of Plast Future East. Exhibits for display can be brought into the Fair Ground from : Indoor Raw Space: 15 November 2016, Built up Space: 15 November 2016. A. Grouting, digging in floors or walls is not allowed. Raised wooden platform of not morethan 4 inches in height may be allowed. B. Painting or nailing (and use of screws) on the partitions supplied under shell scheme is prohibited. Photographs, Charts etc. may be fixed with adhesive tapes or suspended with nylon threads with the help of clamps hooked on the top horizontal channel. C. The load bearing capacity of wooden flooring provided by the organizers for indoor space will be 200 kgs per sqm. In case the exhibits are likely to exceed this limit. The Exhibitors may please inform the Organizers immediately on confirmation. D. Partitions or dividers in the stands should not be erected on the open side of the stand. The height of the partition or divider should not exceed 2.5 mtrs. Both sides of the partition wall should be property finished or painted; particularly the partition from the neighbour's side should not look unfinished. By 1800 hrs on 17 November 2016 with all Exhibits in position. Exhibitors will be required to make good all damages or make payment in lieu thereof of the Exhibition Area facilities/buildings etc. incurred during setting up and/or dismantling period of the Fair. Against all ascertainable risks from transportation to display and removal should be done by the Exhibitors at their cost. The Organizer will in no way be responsible. Sound Level within the stall should be within 40 decibels. The organizer reserves the right to photograph any exhibit for its use. If the exhibitor withdraws his participation after confirmation the organizer reserves the right to forfeit the amount or part thereof against expenses already incurred. Any and all expenses chargeable to Exhibitors must be settled before the closure of the Fair to ensure smooth removal of goods from the Fair site. All unresolved matters, questions, dispute or differences whatsoever arising between the exhibitor and organizers shall be settled by arbitration in accordance with the rules of the arbitration and conciliation Act 1996. President of the nocci shall be the sole arbitrator. The arbitration proceedings shall be conducted in the English Language in Balasore, Odisha, India. The Arbitration agreement contained in this paragraph shall be solely and exclusively governed by the laws of India.